ST. PETERSBURG, FL - JUNE 19: Gregor Blanco #7 of the San Francisco Giants celebrates with teammate Brandon Belt #9 after scoring off of an RBI single. 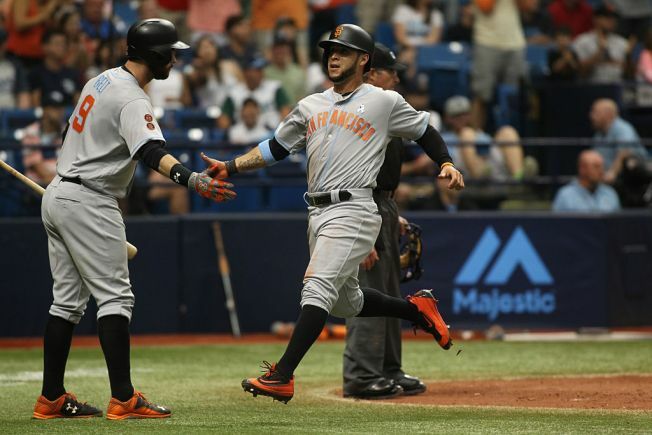 Brandon Belt homered and Joe Panik snapped an eighth-inning tie with a RBI single, helping the San Francisco Giants beat the Tampa Bay Rays 5-1 to extend their winning streak to a season-best eight games on Sunday. Jake Peavy (3-6) pitched six solid innings to win for the third time in four starts and complete a three-game sweep. Belt hit his team-leading 10th homer off Rays starter Jake Odorizzi, and Panik delivered in a key situation for the second straight game with his run-scoring single against Xavier Cedeno (3-2) during San Francisco's four-run eighth. Panik is just 2 for 14 through three games of San Francisco's week-long road trip, but both have broken late-inning ties. His three-run, ninth-inning homer was the big blow in Saturday's 6-4 win over Tampa Bay, which has lost four straight. The Giants matched their longest winning streak of the season. The NL West leaders are a major league-leading 27-8 since May 11, the day Giants began their other eight-game run. The Giants looked like a team playing a game that started a little after 10 a.m. San Francisco time - committing three errors in the first two innings, with one of the miscues allowing Tampa Bay's only run to score. But the Rays weren't able to capitalize on the sloppy play, going 0 for 8 with runners in scoring position through three innings. Belt's second home in three days wiped out a 1-0 deficit in the fourth, and Peavy kept the game close by retiring 12 of the last 13 batters he faced after giving up a leadoff single to Evan Longoria in the third. Both starting pitchers allowed one run and four hits over six innings. Peavy walked one and struck out eight, while Odorizzi fanned eight without walking anyone. The Giants broke the game open against Cedeno, who had been tough on left-handed hitters lately. Opposing lefties were hitless in their last 14 at-bats against the reliever, however the lone out Cedeno was able to get against four lefties who began San Francisco's big inning was Denard Span's sacrifice bunt. Gregor Blanco and Panik singled, and Belt drew a walk that ended Cedeno's afternoon. Posey greeted releiver Tyler Sturdevant with a RBI single and Conor Gillaspie followed with a two-run double - his first hit since May 14. Giants: RHP Sergio Romo (right flexor strain), who's on a rehab assignment with Class A San Jose, could return during a five-game homestand that begins next Friday. . C Buster Posey was given a break from defensive play for the second consecutive game and was the designated hitter. Rays: RHP Ryan Webb (right pectoral strain) made his second rehab appearance Saturday, allowing one run and two hits over one inning for Triple-A Durham. With Baltimore's Manny Machado beginning a four-game suspension Sunday, Giants 3B Matt Duffy now has baseball's longest active streak for consecutive games played. Duffy appeared in his 188th straight game, which is about 15 years short of the record of 2,632 set by Cal Ripken Jr. "That blows my mind. That's a long time," Duffy said of streaks compiled by Ripken and Lou Gehrig (2,130). "For me, it kind of drives home how good those two guys were for so long." Giants: Madison Bumgarner (8-2, 1.91 ERA) faces Jeff Locke (5-5, 5.92) in the opener of a four-game series at Pittsburgh. San Francisco hasn't lost a game Bumgarner started since April 20, a string of 10 appearances. The left-hander is 7-0 with a 1.27 ERA, 78 strikeouts and 18 walks during that span. Rays: Begin a seven-game road trip to Cleveland and Baltimore, with Drew Smyly (2-7, 4.75) facing Indians right-hander Josh Tomlin (8-1, 3.27) on Monday. The left-hander is 2-2 with a 3.93 in 14 career appearances against Cleveland, including four starts. It's only the second time Smyly has faced the Indians with Tampa Bay.